As a young adult I totally bought into the whole “Politically Correct Nutrition” idea that fat was bad, especially animal fat. At one time I attempted to become a vegetarian for ‘health reasons’ and I’ve been on numerous low fat diets through the years. Imagine my surprise when I first read Nourishing Traditions by Sally Fallon and found the very first chapter of the the book completely turn my thoughts on avoiding fats upside down. I have to admit the idea of eating fat instead of avoiding it to improve my health scared me. But eat it we did. In fact switching from margarine to butter was a huge step for me. Once I got past the whole butter is bad brainwashing that I’d been buying into, I was totally happy to eat the butter. It sure tasted a lot better than margarine and was a pleasure to eat. After that, there was no turning back. An amazing side benefit to this new fat filled way of eating was my losing almost 40 pounds. That certainly never happened on any of the low fat diets I did. We now quite happily enjoy not just butter but coconut oil, palm oil, duck fat, chicken fat and olive oil. Not to mention whole (raw) milk with plenty of cream, farm fresh eggs and grass fed beef with the fat left on. I have to admit, I thought we were doing really well on the amount of fat in our diet since we switched to a real/whole/traditional diet. But doing GAPS I realized that while we were getting more fats than ever before I had not been as diligent (especially lately) in making sure we were getting enough fat and specifically not enough animal fats. Gut and Psychology Syndrome by Dr. Natasha Campbell-McBride (the book the GAPS diet is based from) has a great chapter devoted to Fats. She talks alot about animal fats and their importance and even the importance of cholesterol. Cholesterol (you know, that thing that people take pills for to lower) is important for memory. Taking anti-cholesterol pills can actually cause people to have trouble remembering things whereas eating cholesterol rich foods can improve memory. Dr. Campbell-McBride recommends anyone with memory problems or learning problems to eat plenty of cholesterol rich foods each day. Foods that are rich in cholesterol help the body to produce cholesterol allowing our bodies to not have to work as hard (did you know that cholesterol is made in our bodies and not ‘put into’ our bodies by food?) and with a GAPS person that is important. GAPS people tend to have high levels of toxicity and nutritional deficiency that prevent us from producing enough cholesterol. Dr. Campbell-McBride states “Research shows that people, who are unable to produce enough cholesterol are prone to emotional instability and behavioral problems.” Not having enough cholesterol can result in other issues such as adding to adrenal fatigue and causing our immune systems to not function properly. I totally see the truth in these things. I ‘needed’ anti-anxiety medication several years ago and now wonder if there isn’t a direct correlation between the low fat dieting yo-yo I was on and the need for those meds. Doing GAPS Introduction has increased my awareness of needing good, high quality fats in our diet. Now just like the ‘olden’ days I’m scrutinizing the amount of fat in each meal I prepare. But instead of making sure there is as little fat as possible, I’m loading up on fat. Cooking with game, I often wonder if we get enough natural fat in the traditionally lean meat. Just to be sure, I’ll add a dollop of ghee or duck fat to each persons bowl of antelope stew or I’ll slather some butter on the cooked antelope steaks. Cooked vegetables get a dose of fat too. If I’m boiling them, I boil in broth (saving the broth for drinking) and then add chicken fat or butter to the finished veggie. A current family favorite is sauteed assorted veggies cooked in ghee or ghee/coconut oil mix. When everything is soft and yummy I finish it with fresh cream adding an extra amount of fat and a wonderful flavor. My favorite new snack is also fat and cholesterol rich. An egg fried soft in plenty of ghee and any ghee left in the pan poured over the top then finished with a good amount of sauerkraut. YUM. Considering that I have never enjoyed fried eggs before GAPS, I find it amazing that this is a food I crave. Bring on the ’emotional stability producing’ cholesterol that is in eggs! What is your favorite way to add healthy fat into your diet? Need more information about why to add good, healthy fats to your diet? 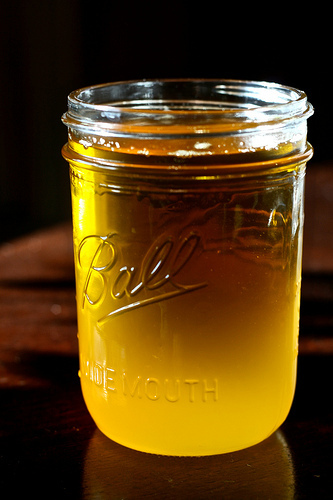 Three great online articles are the Skinny on Fats, The Oiling of America and Know Your Fats.